The Dallas Business Club invites you to Thunderbird’s “Super First Tuesday” Networking Event + Tbird Professor Talk "Want Your Next International Venture to Succeed? Better Check Your 'Tudes" on March 7 @ 6:30 pm. The Thunderbird Alumni Chapter in Dallas, Texas invites you to join them for their “Super First Tuesday” networking get-together! Every March, Thunderbird alumni chapters around the globe take part in this worldwide networking event—and it’s the perfect time to meet our alums, professors and learn firsthand about the value of the Thunderbird experience. Thunderbird Admissions team will also provide program overviews and 1-1 sessions with potential applicants. 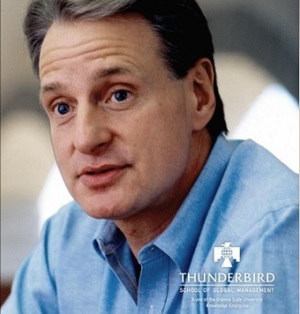 Visit www.thunderbird.asu.edu to learn more which master program is right for you. Tue, March 7, 2017 | 6:30 p.m. – 8:30 p.m.
Special Guest: Richard Ettenson, Professor and Thelma H. Kieckhefer Fellow in Global Marketing and Brand Strategy. Presenting: "Want Your Next International Venture to Succeed? Better Check Your 'Tudes" Building on his recent article in Harvard Business Review, Thunderbird Professor Ettenson discusses and reveals the hidden internal barriers that can derail an otherwise promising international expansion effort. He also provides a short diagnostic tool for attendees to help gauge their own organization's internal readiness for overseas expansion. We hope you will join Dallas Tbird alumni chapter for this networking event! Also, please feel free to invite anyone that also might be interested in learning more about Thunderbird.